Years ago, most all guitar strings had "silking," that little fuzzy winding where the string is twisted to hold the ball on the end. Nowadays, most manufacturers are a bunch of cheapskates who don't give us that nice little touch. That's good news to me! 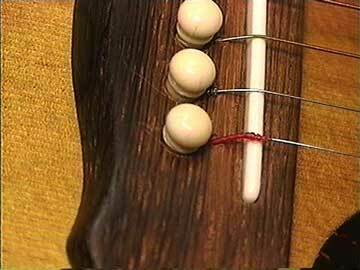 A few strings are still made with that annoying little fuzz wound on the end. It can get snagged in the bridge pin holes, jam the pins up, and generally get in the way. I know of no good reason for it to be there! If the winding lands on top of the saddle, it will for sure dampen the transfer of energy to the bridge, and cause a dulling of the tone. Usually this only happens when the bridge is too thin, or when the string ball is not seated properly under the bridge plate. You might be looking at a guitar that could benefit from a bridge plate overlay.